A Flutter Plugin for generating custom Android Toasts, completely in Dart code (no channels). Avocado Toast is a Dart plugin for Flutter apps, allowing developers the opportunity to add traditional and custom toasts to their Flutter-made Android apps, using either strings or widgets. 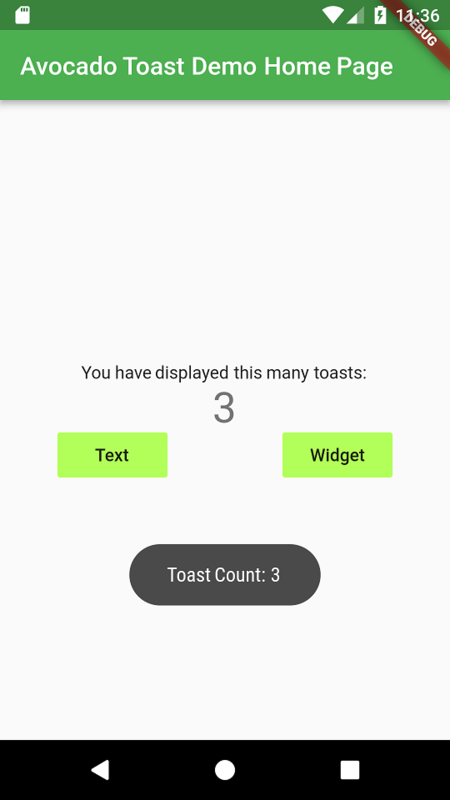 Currently, Flutter has not included a traditional toast widget to their material package. That's actually a really good idea. There's nothing wrong with creating a channel, especially when the widget is meant to emulate functionality only found on Android devices. However, I wanted to create something that would have a limited connection to the native layer, add nothing to the dex method count, and exist in a single .dart file. A widget with an image of Avocado Toast inside an Avocado Toast Toastable() widget. You're welcome. The MIT License. Now go forth and make Toasts like it's 2008! Please see the attached LICENSE file for more information. You can find the plugin by searching for avocado_toast at https://pub.dartlang.org, or you can download the Flutter plugin here!